I liked mine so much, it's been laying on my floor since I plugged it in. (24SEP2000) I'm amazed that people are actually selling these on Ebay. Well, I guess it's a little cheaper than ordering one for $10 from DC... If you haven't seen it already, have a look at Michael Ducy's Cordless CueCat (turn your CueCat into a useful flashlight!). Note that it's similar to Sean Kauffmann's 07A00, but Sean's has the designation (FM+H Rev 0.3) screened on the board while the above shows (TM+H Rev 0.3). Several people have also confirmed that a declawed CueCat will still work fine with the CRQ software. reading about keyboard interfacing lately, but it hasn't sunk in far enough yet to tell you for sure that the computer takes the data line high and the keyboard waits for it to stop doing that to start clocking). You mention that the model A with the toshiba cpu comes after the one with the hyundai cpu. I respectfully disagree. I have worked in a large surface mount factory (SMT) that builds many different assemblies for different customers who outsource their production. I worked as a test/QC/production technician and offered suggestions on how designs might be simplified and improved. connect that with wires to the main board. But the clincher to the argument has to be the scanning orifice. Take a look at the photos on the web page side by side. The scanning orifice for the "model A" is larger and the housing looks like it was designed for that originally. Looking at the smaller orifice you see that it is half the size but yet the housing is still the same size as for the larger one. Why isn't the housing smaller if it came first? The only problem I have with my own argument is the RAM. Because the ram is a pricey part. But chip supplies have been increasingly tight this last year, and it may be that it was more cost effective to have an 8051 plus ram rather than just the toshiba cpu. adding the ram is why there is the 74HC373. The Toshiba CPU could cost three bucks. But the 8051 could be $.75, the 74HC373 $.25, and the ram $1.00 (guesstimates), thus you would save $1.00. Take away a led and use cheaper photodiode you save another $.75. Even though the board is a little bigger, the fact that it is a single piece is a big plus. It's true that the blob-tronics are a cheaper design. My guess is that this is the "middle version". possibility that the have two plants making these simultaneously. The hyundai cpu version made, and another making the blobtronic version. Even if one was more expensive than the other, it might be more important to achieve quantity rather than savings. Another factor is that there are allot of part shortages going around, so if they had two designs, they wouldn't be hung up on production if they couldn't get a part. Also, it is clear that they wanted the cuecat to scan _any_ barcode. So while the model As are a simpler design, the addition of a lens in front of the photodiode in the hyundai version probably makes it perform better. And adding the ram gives you a chance to do more work on the scanned data, again increasing performance. I could be wrong, but the hyundai version seems like a more refined design. It would be interesting to compare the two to see which one was better at scanning in different conditions with different barcodes, and see which one is more accurate. Like with a bright light shining on the cuecat, as I think this is why there is the black cardboard in the hyundai version. Some mice will stop working with bright sunlight shining on them because light "leaks into" them. I only have the hyundai cuecat, and can't spend too much time on this. But it would be interesting to get other people's thought on this. Sherrod Munday wrote in with some very interesting info on the small 5-pin serial ID chip that is showing up on some CueCat revisions. 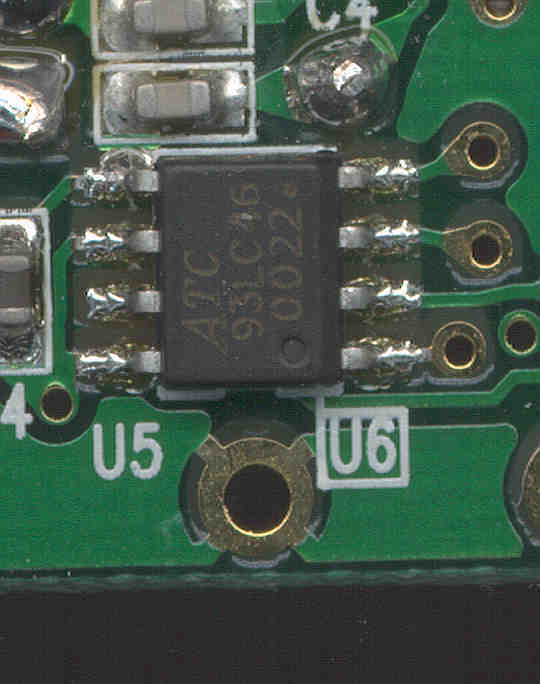 Note that U5 is the normal 8-pin 93LC46 and U6 is the smaller 5-pin device that fits in the same spot on the board. 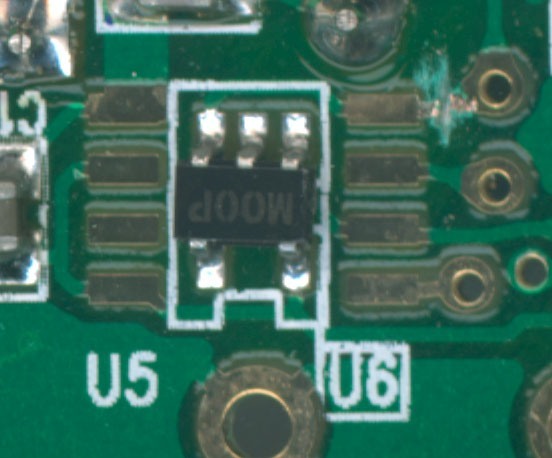 On the 07A00, U6 is a small, 5-legged device with three leads coming out of one side, and two on the opposing side. Markings on the image submitted by Sean Kaufmann show L00F, while my unit showed L071. There are no other identifiers present on the chip. 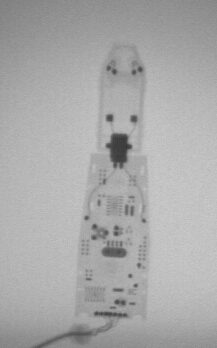 With the board oriented so that the silkscreened "U6" is right-side-up, the three-legged side is on top, and the two-legged side is toward the bottom of the circuit board. 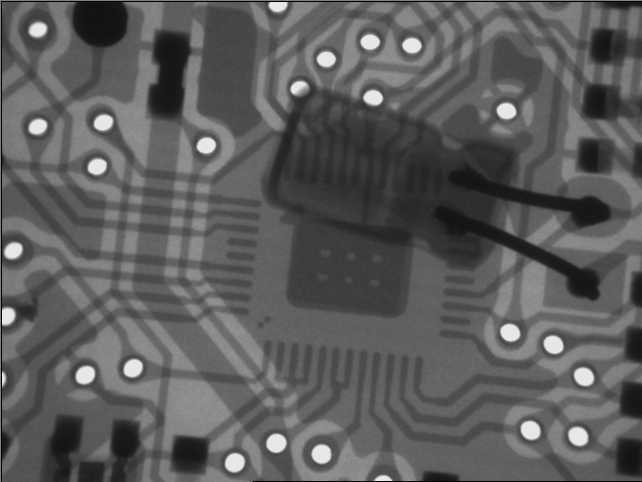 Immediately adjacent to the chip are eight unused pads on the circuit board: they are spaced out to accept a chip the same size as the ATC93LC46 (used on the original model 68-1965). 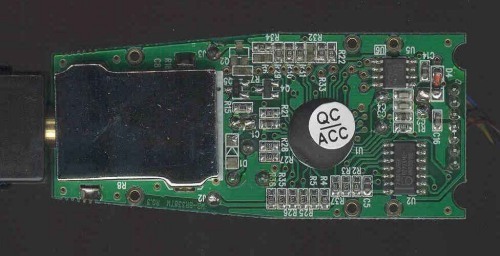 There are four pads on the right of the chip, and four pads to the left. Pinout: I'll use letters, since I can't tell which is pin one on the chip (I know, this isn't very good, but I can't tell anything about the chip). 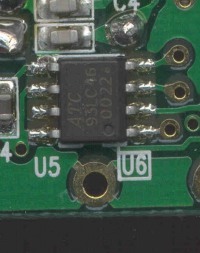 This layout is given with the PCB in the same orientation as described above -so that you can read "U6" right side up. E To pin 8 and 6 of unused pads. (Lower-left corner, farthest away from uC). Also connects to +5 VDC source. So it's apparently a 4-connection device, with 2 for power and 2 for data. I don't see a serial number data pattern on my scope upon power-up. I do find a clock-type pattern (quite regular) on pin C each time I run a bar code. The pattern is only present immediately prior to the output generation of the serial data to the computer. Pin A seems to be used for the serial number output of U6. I couldn't get a good enough read on my scope to determine its format, though. Since everything else is so similar to the original 68-1965, I'd be willing to wager it's stored on the chip in the same way. Both Pin A and C are normally high (+5Vdc), and are pulled low during pulses. Based on observations, I'd guess Pin A is Data Out and Pin C is Clock. Since I'm not one to go cutting traces unless it's necessary, I used desoldering braid to simply remove the chip from the PCB. Cuecat version 07A00 is now declawed. Fairly simple, yes? Note that declawed version 07A00 outputs the same S/N as the first 68-1965A that you reviewed. So apparently, even though they seem to have gone to a custom microcontroller and changed the serial data chip, the functionality is the same. Out of curiosity, I tried placing the ATC93LC46 chip from my original model 68-1965 into the correct orientation on the 07A00, hoping it would pick up the identity of the older unit. No luck. Jack Hintry noted that his CueCat has the same 5-pin chip, but with the inscription 'M00P'. 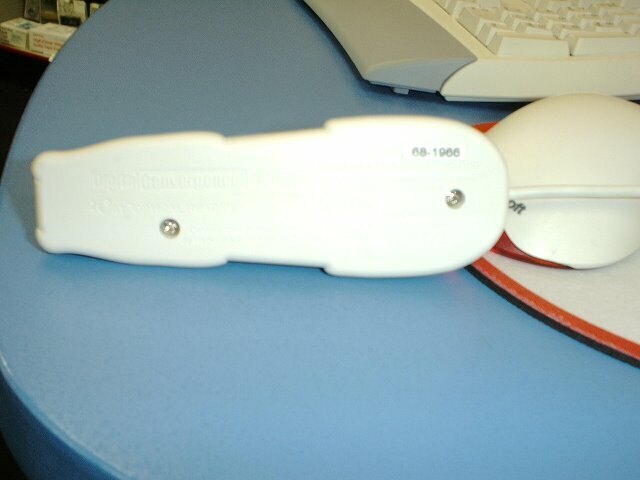 I'm wondering if the lettering on this device (so far we have M00P, L00F and L071) is shorthand for the serial number contained inside. Could this be something like Dallas Semiconductor's silicon serial number? The button is just a small pushbutton I picked up from Radio Shack (while snagging another CueCat, of course). Snip the power line (red on the 'A') and run wires up to the switch. Press the button, whisk it past a barcode, release button. Minimal power draw! Only problem I've had with it is on bootup - if you don't hold the button down (to power on the CueCat), the BIOS spits out a keyboard error. This is on a desktop, though - on a portable it would probably be fine. 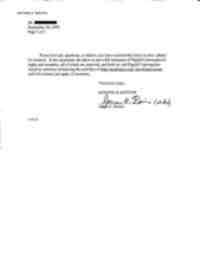 Michael Rothwell has gotten a reply to the letter he sent to DC's lawyers, but it's just as vague as the first one. Not too surprising, I suppose. (26 SEP2000) Doug Good has a great site up for you Delphi coders out there - have a look at http://www.angelfire.com/pa4/cuecat. Checked up on Michael Rothwell's page, and Stephen Satchell has some interesting thoughts on DC's rationale for who to send nasty letters to - it seems that DC may primarily be trying to crack down on software that is used to "establish links between barcodes and Web content". That is, if your software takes a bar code and fetches a particular web page based on that input, DC gets mad. 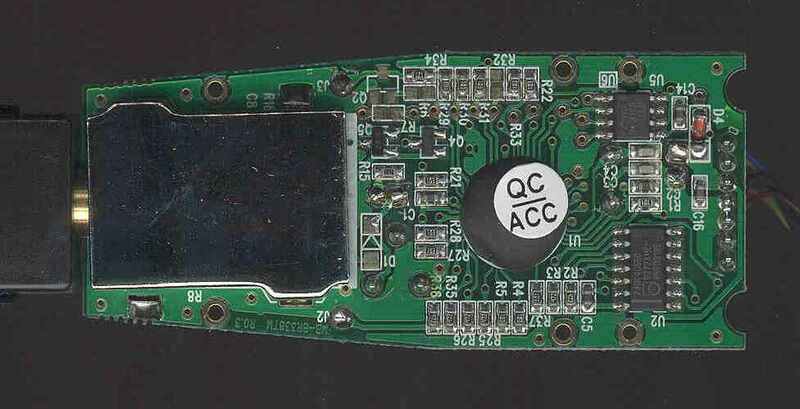 Stephen is also guessing that the firmware revision number is embedded in the CueCat serial number - read more here. But enough about that, back to hardware. 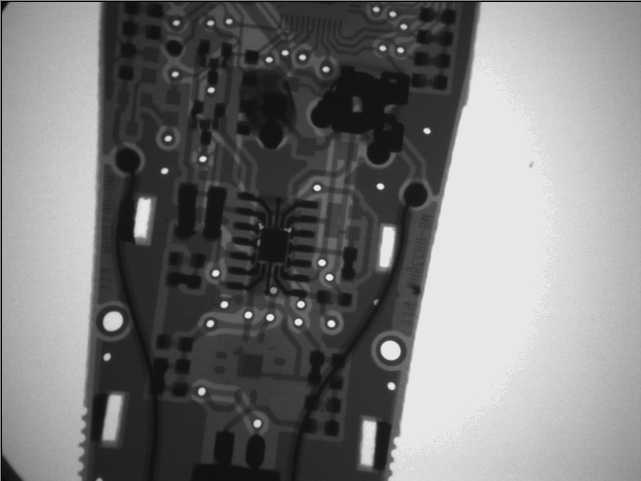 A.D. (who apparently has some really fun toys at work) was kind enough to bombard his CueCat 07A00 FM+H Rev 0.3 board with radiation in an attempt to see what's hidden under those blobs of epoxy. Although the resolution isn't quite enough to give much information (you can just barely make out the circular epoxy blobs), it still makes for a very cool picture! 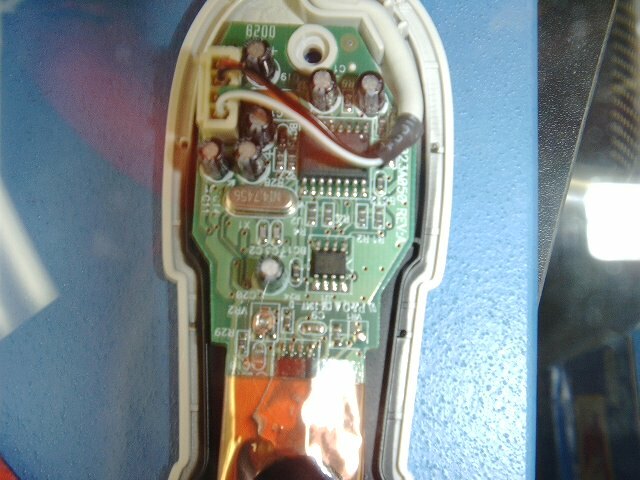 Note that Jack has successfully declawed this one by slicing through one of the traces (this is presumably the DO line for this device). 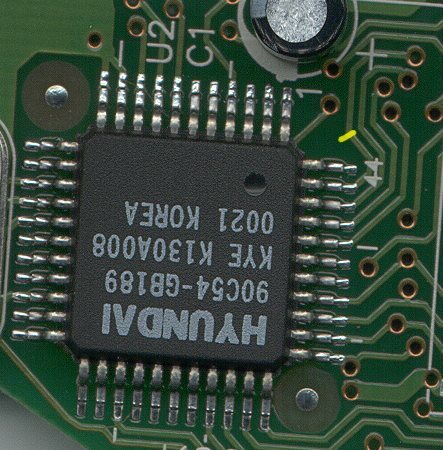 Can anyone identify this mystery chip? (The letter was addressed to my boss, who is listed as owner of the domain (but I admin the site) - I've blacked out the name and address, as he's really a cool guy, and I don't want to drag him into the mess.) For what it's worth, K&K sent it to our old address - kudos to Fedex for getting delivered properly. K&K or DC, please email me for my correct correspondence address (which I had originally posted, and I know you guys read the page). 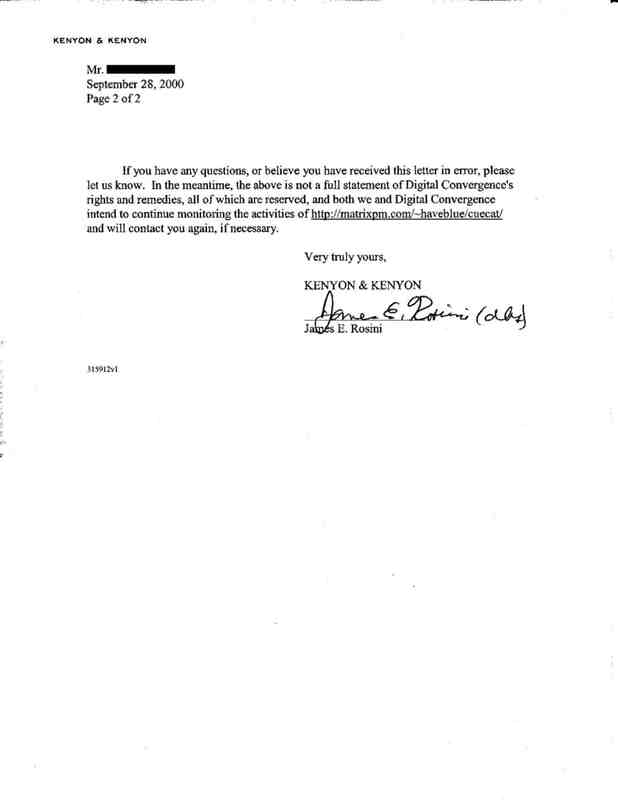 Note that the letter is just like the one sent to Michael Rothwell and other software developers. Leave it to a lawyer to be so incredibly vague. Anyhow, this would seem to invaildate Stephen Satchell's theory that DC's beef is with software, as I've been careful to focus only on hardware. Look, guys, you don't control the hardware - you're giving it away. Please grow a clue. (1OCT2000) Man, what a busy weekend... Had this article show up on Slashdot, and then our connection pretty much died due to the load. Note to small-time web admins - if your site shows in a Slashdot article, be sure you have mirrors in place. (Even better would be if CmdrTaco implemented automatic mirroring of a site prior to an article being posted on Slashdot). Anyhow, at my employer's request, I took the entire site offline and moved the page and files to my own personal server (air-soldier.com). The last thing I want to do is legally endanger my employer in any way - this is my fight, not theirs. So now that the page is on my own machine, hopefully I'll get a personalized letter from Mr. Rosini. Today, I got this response from Charles Richardson of DC. way for you to conveniently return this to us. 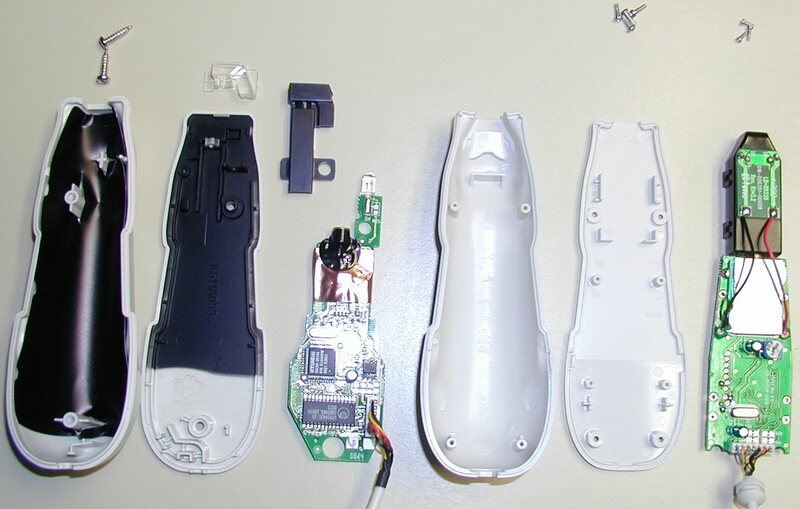 >I recently received a ":Cue:Cat" device with a magazine subscription. >have no way for you to conveniently return this to us. I eagerly await your clarification of the matter. We'll see what happens. I'm guessing I'll get no reply on the matter. lines between the keyboard and the computer. 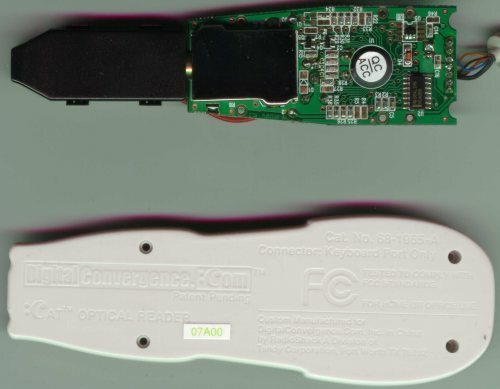 Roughly when the :CueCat (or any other keyboard wedge device for that matter) wants to send some data to the computer it opens these switches breaking the connection between the keyboard and the computer. 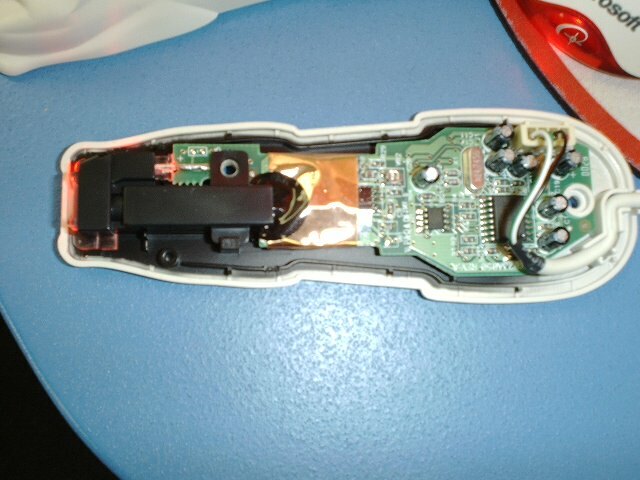 The onboard microprocessor will then pull the clock line low on the keyboard side to prevent the keyboard trying to send any scan codes to the computer. The onboard microcontroller then sends the keyboard scan code data to the computer as per normal. When this has finished it closes the switch and lets the clock line go high again. 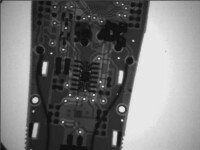 Obviously the microcontroller has to watch the clock and data lines so that it does not break the connection between the keyboard and computer when they are in the middle of talking to one another. Hope this helps." 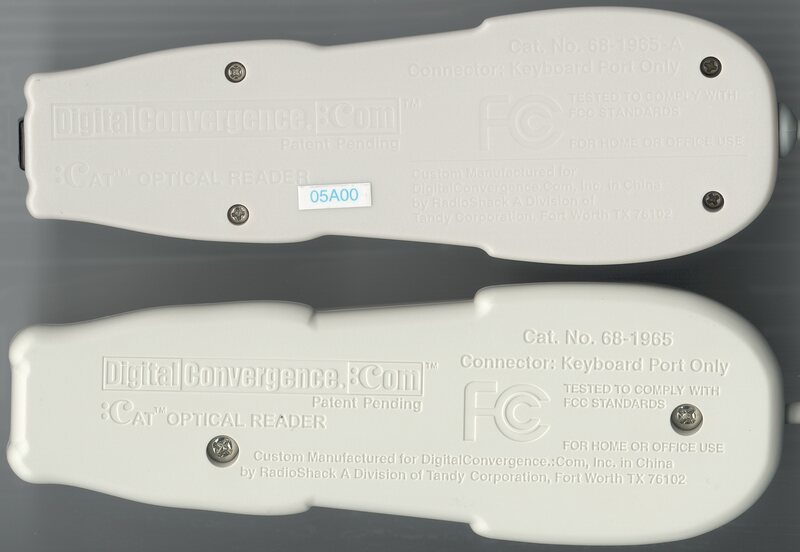 Leonid Broukhis has been toying a good bit with comparing differences between firmware revisions on the CueC... er, a 'certain free barcode reader'... The revisions (apparently noted by the last two digits of the serial number) do differ slightly in the types of codes that can be read - see his work at http://www.mailcom.com/BarcodeTest/. Leonid has even managed to create a barcode that returns random garbage with a rev.02 scanner! Shakki pointed me towards this interesting post: http://www.topica.com/lists/pla_upl/read/message.html?mid=1702776249 Apparently, it's possible to disable the CueCat's (ridiculously weak) encryption by tying a particular line of the microcontroller to +5v. Seth Henry confirmed that it does in fact work - I'll give it a try myself later. Louis Papineau has found yet another bug in the CRQ software: "When you install the software, it asks which browser you want to use. I have both IE5.? and Netscape 4.72 installed, IE being the registered browser. I told the CRQ software to use Netscape. I checked the registry and it is confirmed that it should use Netscape. However, whichever browser you have open is the one it will use, not necessarily the one you have chosen." This is not a support issue. We do not have a way for a customer to conveniently return unwanted Cats. I do not intend to engage you in a discussion involving the legality of my response. "I see. Can you recommend someone at your company that _can_ discuss the legality of your response to Mr. Lee's inquiry?" I have escalated your previous message to my management. I'm certain that it will reach a level where someone might respond to you. I do not intend to reply to any further messages from you about this. Since this will without doubt be added to your web page let me end simply by saying "Hi Mom!" This message too will be escalated. Good Day Sir! Well, at least someone over there has a sense of humor... Thanks Charles, I appreciate the help. 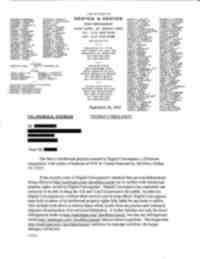 (5OCT2000) The lawyers are still hammering out those letters, it appears - Andy Wysocki of http://cuecat.bearsoft.com/ is the latest recipient of a K&K nastygram. Just in case Allaire takes a dim view of Joe S's cold fusion scipt, the files are here. Minion added a pic and instructions to his page showing how to perform the decrypt hack on a 06A00 CueCat (note that units with the same date sticker don't necessarily use the same PCB). (8OCT2000) Sore after a great day of paintball yesterday - go blue team! Bill has a great hardware site up at http://cexx.org/cuecat.htm where he shows how to perform serial number removal and encryption removal using his (TM+H Rev 0.3) as an example. He also notes some odd behavior when jumpering +5v to a particular processor line. 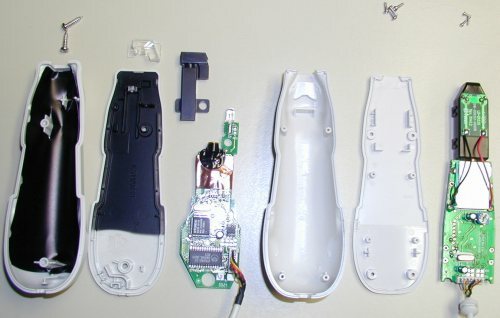 Happy Hacking Cradle users, rejoice! Tom Zerucha has coded a little program for use with the CueCat. Check the bottom of http://www.execpc.com/~tz/ And it's even GPL'ed! Fantastic photos - thanks Bob! "Hey, I grabbed Larry Wall's disturbing script off of your page and played with it some. Since Azalea's fonts return the requested data in an encoded form (see the PDF), I figured it might be nice to have a decoder for it. So after a few painstaking hours of figuring out how to restrict the input sequence to one line (use <STDIN>), I managed to put together a script that will take as input one swipe from a CueCat of Azalea barcode data (everything else comes out native) and will return that number you originally typed into the little program to get the barcode string. I discovered a rather disturbing behavior of our favorite feline as well; some barcodes don't scan correctly left-to-right but scan fine right-to-left. Try "234567" and "23456789" in Azalea coding for examples." The 2 screw case, Hyundai CPU version can be converted to plain ASCII output by lifting pin 10 of the Hyundai CPU. Pin 10 is normally connected to ground, so if you solder a wire from 5v to pin 10, you will have a short! Do not do this, instead seperate pin 10 from ground. When pin 10 is unsoldered (or cut), it will float high, no need to solder it to anything. 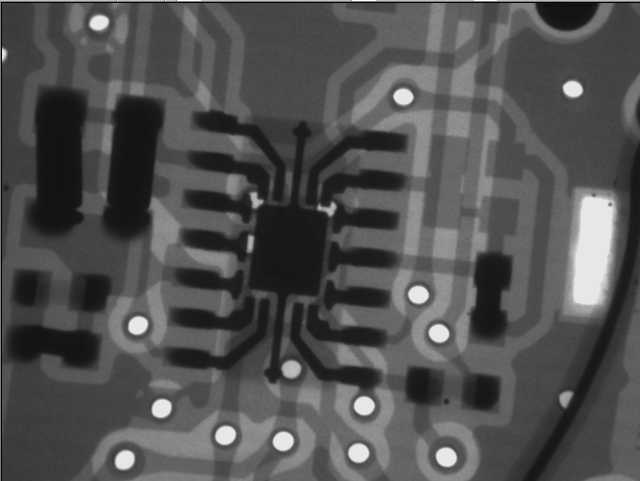 There is a short length of PCB trace between pin 10 and the ground plane. 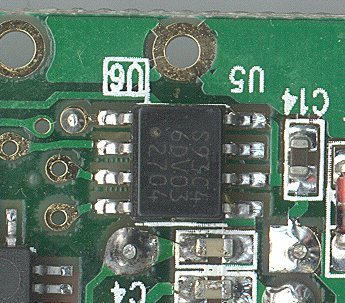 This can be cut with a sharp knife, or one can use a soldering iron and desolder ing braid to remove the excess solder on pin 10, then gently pry it up with the tip of a sharp knife while heating with the soldering iron. to 5v AFTER changing the switch on pin 10 in order to get the output format to change. "I know it could be done much more elegantly using the lookup table rather than doing an actual 64 table then XORing, but this was a fun way for me to play with bitwise operators... enjoy!" "I, unfortunately work at Radio Shack; you're right about the blank stares part--They train us in selling cell phones, MSN rebates, and Sprint Long Distance but not the component stuff that Radio Shack was always known for...) Anyways...one piece of trivia: my manager has been instructed to "account for every cue cat" and should a customer not want to give their name and address we should charge them $29.99 for it! Also; a USB version is (or was) in the works...there is one that is around now, but I believe it is only used in the Radio Shack stores on their MSN kiosk/display. I expect this is due to the fact that the displays run the Microsoft internet keyboard, which is also USB. I have not gotten the opportunity to examine it closer but I believe it is actually a 68-1965 with a USB connection--not the 68-1965A, but these may be pre-production... It only has the one LED. According to my manager--before the cats were formally introduced--A USB version was planned to replace the keyboard-only versions as free giveaways. Digital Convergence may have changed their minds since then, though... An interesting feature of it: it turns itself off after a certain period of time!" 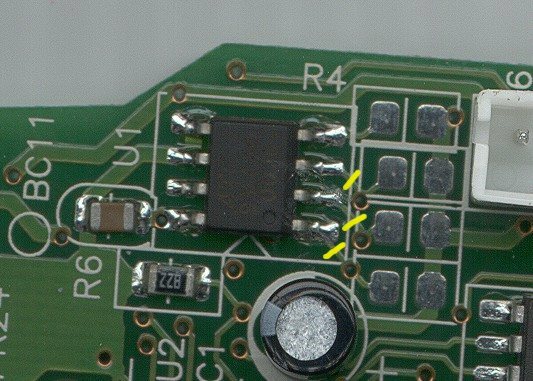 The obvious differences inside are the 4 USB wires and the addition of a number of capacitors, and of course the overall arrangement of circuitry." How exactly did you eliminated the recent security breach involving the :CueCat product? When do you expect the outside agency to complete the systematic audit of all your systems? Do you plan to publish the results? Does your company plan to "provide a patch that disables the ID number for current users... notify users of the existence of the tracking potential... [and] that future version of the product have the user ID feature disabled." 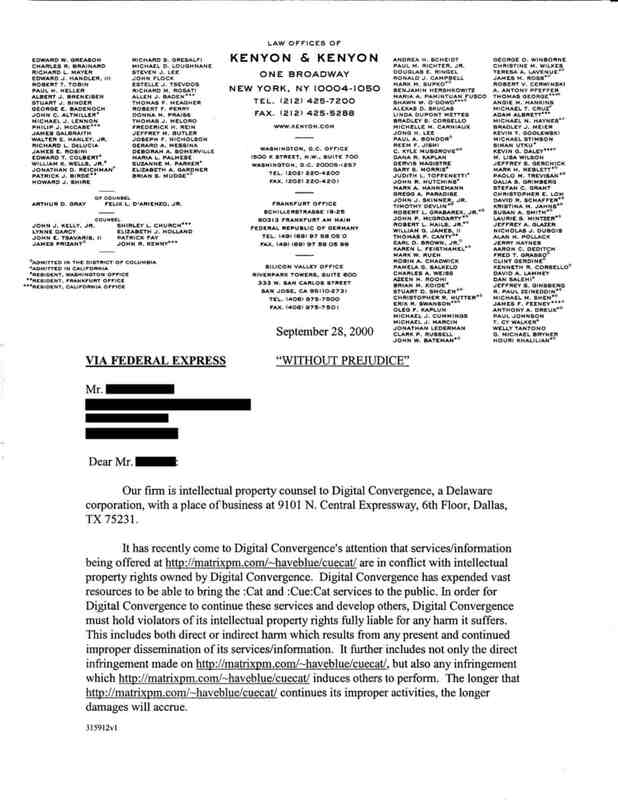 as Richard Smith of The Privacy Foundation has suggested on 09/25/2000? Here are some answers to your recent followup questions concerning our security breach. We eliminated the breach by reorganizing our web department so that deployment of web servers must go through a security audit before they are put into production. The security audit was completed about a week ago. We are not publishing the results, but we plan to have a second agency repeat the process in a month to validate any improvements which the first reported on. With respect to the tracking issue, We have always disclosed to our users that we collect aggregated date. That is we know how many women of a certain age group in Dallas swipe a cue in The Dallas Morning News, for example. We do not, and cannot track individual swiping behavior. We do not plan on publishing such a patch as it would negatively impact our business going forward. The privacy foundation's assessment was based on a technology study, not a business study. We have been working with the Privacy Forum to ensure that privacy concerns are addressed.